8 CAR GARAGE--DETACHED 40'X40' 5 CAR RV GARAGE W/WORKSHOP & 3 CAR ATTACHED ON 2 VIEW ACRES! 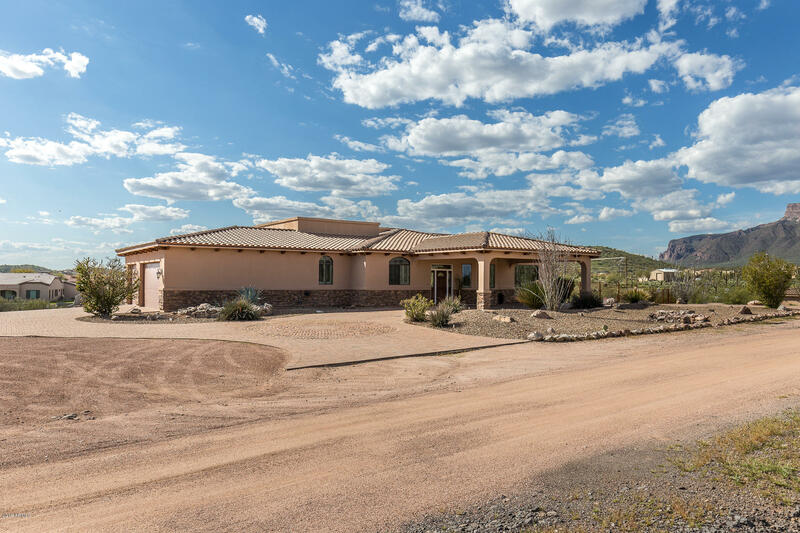 CIRCULAR PAVERED DRIVEWAY WELCOMES YOU TO THIS 2005 CUSTOM HOME FEATURING 5 BEDS, 4 BATHS & STUNNING SUPERSTITION MOUNTAIN VIEWS. GOURMET KITCHEN BOASTS BEAUTIFUL SLAB GRANITE, PROFESSIONAL 6 BURNER GAS RANGE, STAINLESS APPLIANCES & HUGE ISLAND. LARGE LIVING ROOM FEATURES STONE FIREPLACE & ENTERTAINMENT WALL. MASTER SUITE SPORTS STONE FIREPLACE, COFFERED CEILING, SPECTACULAR SUPERSTITION MTN VIEW, SNAIL SHOWER, JACUZZI & GIGANTIC WALK-IN CLOSET. UPGRADED GUEST BATHS W/TRAVERTINE TILE SURROUNDS, CUSTOM CABINETRY & GRANITE. CUSTOM INLAID FLOORING, PLANTATION SHUTTERS & DESIGNER 2 TONE PAINT T/O. COVERED WRAP-AROUND PATIO, CUSTOM HEATED POOL & SPA, PRIVATE FENCED YARD. NO HOA, CLOSE TO 5 GOLD CANYON GOLF COURSES & WORLD CLASS HIKING, 35 MIN TO PHX SKY HARBOR.